New Zealand police have arrested 17 people and seized a number of weapons during a series of anti-terror raids. More than 300 police were involved in the operation, reportedly targeting Maori sovereignty and environmental activists - not foreign groups. Police Commissioner Howard Broad said those arrested had used firearms and other weapons at military-style training camps. 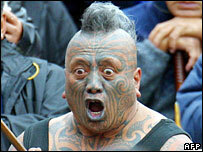 Among those held was the prominent Maori rights campaigner, Tame Iti. The North Island raids were the first use of the country's Terrorism Suppression Act. The people targeted were from "a range of motivations" and from various ethnicities, the police chief said. "Based on the information and the activity known to have taken place, I decided it was prudent that action should be taken in the interests of public safety," Mr Broad said. Armed police raided camps in the eastern Bay of Plenty, as well as a number of addresses in Auckland, Wellington, Christchurch, Palmerston North and Hamilton, police said. Media reports said the raids came after months of work by anti-terror police, with evidence gathered from hundreds of hours of recordings from bugged conversations, video surveillance, and tapped mobile phone calls and text messages. One of the videos reportedly showed a military-style training exercise with live ammunition being fired in mountainous terrain. New Zealand's Prime Minister Helen Clark said she was briefed on the planned police raids last week. Asked if she was surprised by the police information, she said: "Yes and no. Surprised at the scale and numbers of people involved". Tame Iti made headlines last month when he went to Fiji to offer support to coup leader Voreqe Bainimarama.